Who are the super-rich and why they are paid so much? 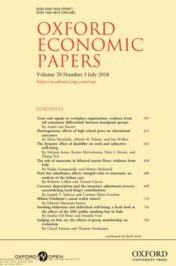 Oxford Economic Papers is a general economics journal, publishing refereed papers in economic theory, applied economics, econometrics, economic development, economic history, and the history of economic thought. It occasionally publishes survey articles in addition to original papers. Books are not reviewed, but substantial review articles are considered. The journal occasionally publishes survey articles in addition to original papers, and occasionally publishes special issues or symposia. One of the most common arguments against contemporary capitalism is that it generates extreme inequalities. Few individuals – it is often said – earn huge earnings, while the rest of society has to struggle to make ends meet. But, who are the super-rich and why they are paid so much? Observing the composition of top incomes reveals a striking novelty for what concerns the “who” question. In fact, while in the past, the large majority of individuals belonging to the richest segment of the population included rentiers or entrepreneurs, in the last few decades there has been a considerable increase in the number of “working super-rich” accessing the top income bracket, as shown by Alvaredo and colleagues. In Italy, for the richest 1% of the population, earnings (from employment and self-employment) accounted for the 46.4% of the total in 1980 while they accounted for 70.9% in 2008 and, similarly, among the 0.1% richest segment of the population, the share of earnings rose from 29.5% to 66.2% in the same period. Among the working super-rich, few selected professions are often at the top of the income parade: sportsmen, singers, artists, writers, CEOs. The answer to the “why” question is instead much more challenging. There are currently at least three – not mutually exclusive – explanations. The first explanation hinges on the differentials in talent/productivity among individuals that, in some markets, can be magnified into huge differences in earnings. Rosen refers to markets in which consumers are able to identify who are the best performers, they prefer to be served by “the best”, and technology allows for joint consumption. Better performers can thus draw large audiences, for instance, in football stadiums, or via TV or selling their books or albums worldwide, with a cost of production largely independent of the size of the audience. A second explanation, proposed by Adler, suggests that superstars might emerge among equally talented performers due to the positive network externalities of popularity. Actually, the appreciation of a particular performer (e.g. football player, singer, or artist) grows with the knowledge consumers have acquired about him/her through conversations with other people. In fact, as a performer’s popularity increases, it becomes easier to find other fans, because consumers are better off patronising the most popular star as long as others are not perceived as clearly superior. 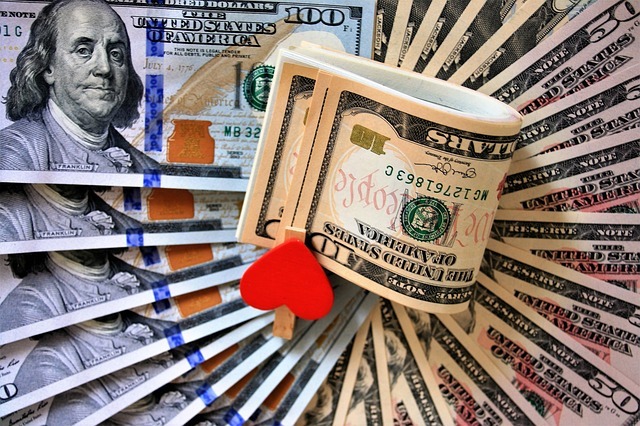 Currency finance the dollar cash by pasja 1000. Public domain via Pixabay. As a third explanation, extraordinary earnings might be associated with the bargaining power exerted by superstars. For instance, managers and CEOs in large companies might be able to fix their own remuneration independent of productivity, exploiting asymmetric information with respect to shareholders, while players in team sports can achieve wage increases by threatening the club owner with acceptance of a better deal from another team relying upon professional agents in order to negotiate better deals with team’s owners, as suggested in the book by Blair. Providing empirical support to these explanations is often complicated due to difficulty of finding appropriate data. Sport statistics represent an exceptional opportunity since “we know the name, face, and life history of every production worker and supervisor in the industry”, as noted by Kahn. At least for what concerns football players, the interpretation of extraordinary earnings based only on very talented workers who “win and take all” seems to be largely incomplete. Investments in popularity and in the choice of the “right” agent seem to be equally – or even more – remunerative than having good feet. Players seem to know this very well considering the time they spend on their social network accounts. Similarly, professional agents are gaining popularity becoming sometimes even more famous than the players they represent. With a few possible differences across sectors, these factors are likely to also explain the earnings of other super-rich such as actors, musicians, and virtually all workers in sectors characterised by a large audience. Whether or not this is fair remains an open dispute. What is less contentious is that these superstars arise in very special markets in which very few individuals play and the rest enjoy the performance. Not exactly competitive markets. Featured image credit: Soccer stadium football by Free-Photos. Public domain via Pixabay. Vincenzo Carrieri is Associate Professor of Public Economics at the Department of Economics and Statistics, University of Salerno, Italy. His research interests are in Health Economics, Income Inequality and Applied Microeconometrics. Francesco Principe is PhD candidate at the Department of Economics and Statistics, University of Salerno, Italy. His research interests lie in the field of Health Economics and Applied Microeconometrics, with a major focus on health inequalities, health policy evaluation, income inequalities and wage determination. Michele Raitano is Associate Professor of Economic Policy at the Department of Economics and Law, “La Sapienza” University of Rome, Italy. His research interests include inequality, social mobility and welfare state policies. They are the authors of “What makes you ‘super-rich’? New evidence from an analysis of football players’ wages” in Oxford Economic Papers. I forget who the player was, but I saw it $120k, and said that’s not bad per year of 40 weeks. My wife nodded. Then I looked again. OMG, that’s a week, and he’s not the best. The best paid player makes $500K a week, has a flash car, and Flops a lot. How much are tickets? The beer & snacks must be expensive. Why would anyone be paid that much? The man who helps with our property in the province makes $3 per day. We pay him $5.00 the people in the town don’t like it that we pay more “because everyone will want more”. Opening the article with Capitalism, who are the super rich and why it is interesting to note that Globalisation has had a marked effect on inequality of income. Income and especially the wealth of the 0.1% the super-rich often dwarf that of football players. Interesting to note also football has entered the globalised world hence football clubs place a premium on their skills which reflects the earning power these young players can command in this increasingly competitive field. Though their career within this league maybe ephemeral but their income is high enough to compensate. On a broader scale, these days the effect of neoliberalism and the takeover of financialisation has segmented society, and only those with super skill can become the super-rich.